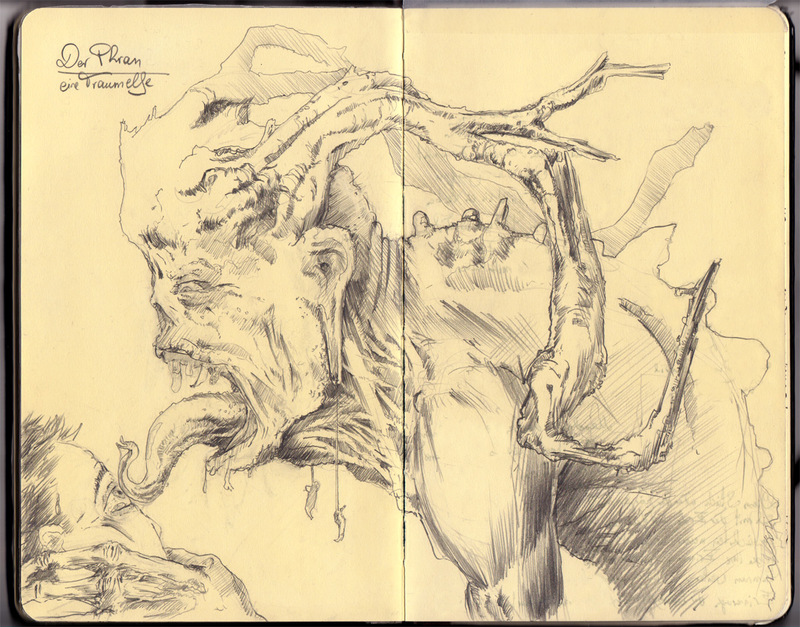 Whenever I am not working on my horror/sci-fi/fantasy web series Shadows of Prey or on my animated science fiction short film Echoes, I like to sketch some critters and creatures into my sketchbooks. Below is a scribble of a predator. In one of my dreams, my shadow told me to draw this. It is a dark fairy which feeds on your dreams. I had written down and sketched the whole life cycle of this creature (which you can see in this blog post), but I did not have a name for it yet. It resembles on of my aunties. Yikes ! Hi john I love your artwork.do you have an email so I can discuss an idea with you for a hosting event. his scary but awesome all at the same time well done ! “Some people follow their dreams. Other’s steal them”. There is a strange yet Interesting movie called The City Of Lost Children (1995) which is based on stealing dreams too which may interest you. Very dark and creepy. Your artwork is mesmerising as always. Beautifully scary. Amazing sketch. Love the way you chose the name. It’s a good idea I may adopt for workshop purposes!! Oh, yes and I think you may be a bit crazy…. Loved your sketch. Dreams seem to inspire artists in all directions, I’ve two stories done for young adults/children that were the result of my dreams. WOnder how many more of us wake and create fantasy/art based on our subconscious collective? Nice sketch! Reminds me of a horror film character in a movie I watched before. Just couldn’t remember the title anymore. This looks absolutely brilliant! Subscribed to the Youtube channel so I can watch the series as soon as I have the chance!